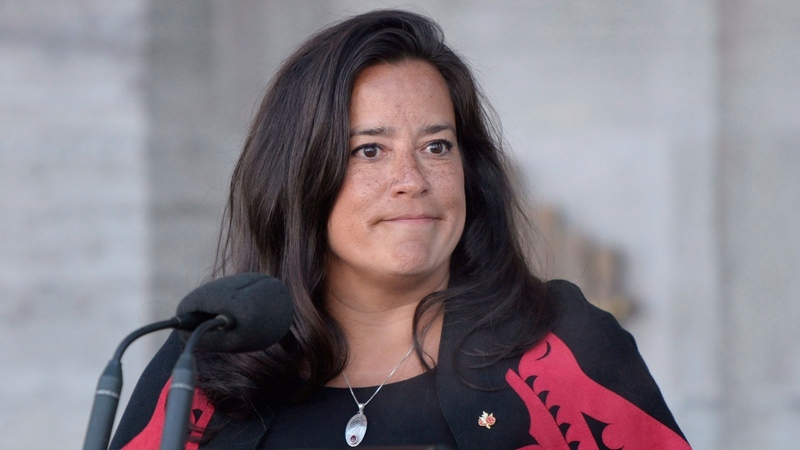 Veterans Affairs Minister Jody Wilson-Raybould is quitting the federal cabinet days after allegations became public the Prime Minister's Office pressured the former justice minister to help SNC-Lavalin avoid criminal prosecution. In a letter published on her website Tuesday, Wilson-Raybould says she has hired former Supreme Court judge Thomas Cromwell to tell her what she can say about "matters that have been in the media over the last week." Wilson-Raybould's letter does not say exactly why she's quitting. It does say she will continue to serve as MP for the riding of Vancouver-Granville. Prime Minister Justin Trudeau's office says Wilson-Raybould told the prime minister Monday night of her intention to resign from cabinet. Trudeau informed the rest of his cabinet Tuesday morning about her decision. "With Ms. Wilson-Raybould's resignation from cabinet, and a cabinet shuffle imminent, it's absolutely imperative that Mr. Trudeau ensure the preservation of these records," Scheer said in a statement. "Canadians deserve to know the truth around what happened and these records must be preserved." Both leaders have public appearances scheduled later Tuesday: Trudeau in Winnipeg and Scheer in Fredericton. Since then, Trudeau has denied he did any such thing. On Monday, he said in Vancouver that he'd told Wilson-Raybould that any decision on the subject was hers alone. "In our system of government, of course, her presence in cabinet should actually speak for itself," he said following a housing announcement -- one that Wilson-Raybould didn't attend, unlike a handful of fellow Liberals from the city. In her letter, the MP says that her decision "is in no way a reflection" on veterans, their families or their service. "I only wish that I could have served you longer," she writes. "When I sought federal elected office, it was with the goal of implementing a positive and progressive vision of change on behalf of all Canadians and a different way of doing politics," the letter says. "My resignation as a minister of the Crown in no way changes my commitment to seeing that fundamental change achieved. This work must and will carry on." "Regardless of background, geography, or party affiliation, we must stand together for the values that Canada is built on, and which are the foundation for our future," she writes. Trudeau is scheduled to be in Winnipeg later today where he will face questions about Wilson-Raybould's resignation.